Split across two unique buildings, a former telephone exchange building and a bank, W Amsterdam is an intriguing design mix of heritage and contemporary style where nights never end and the pulse is set high with a full calendar of exclusive W Happenings.Step inside W Amsterdam Exchange and go straight to the top and check in at our rooftop W Lounge. Experience the innovative design and luxury of our 238 stylish guestrooms, including 23 suites, three WOW suites and two lavish Extreme WOW Suites.Wake up to a new Amsterdam where design, fuel, fashion, and music connect to create an extraordinary dynamic for the city of canals. Leave mild-mannered meetings behind! Right here in our 414 square meters divided into 3 Great Rooms of event space that can be combined. 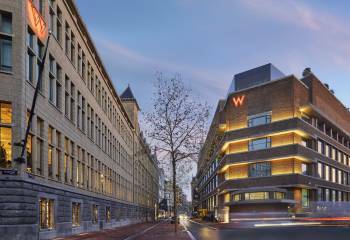 W Amsterdam features fully adaptable conference equipment that makes business beautiful, meetings memorable and special events spectacular.Endless possibilities, creative in approach and innovative in design, we’ll engage and energize your attendees and participants, from conferences to soirées.